Starred In Goldeneye (1995), Tomorrow Never Dies (1997), The World Is Not Enough (1999) and Die Another Day (2002). 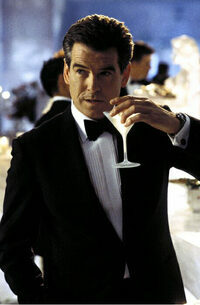 Pierce Brendan Brosnan was born in Navan, County Meath, Ireland on May 16, 1953. He moved with his family to London in 1964 [apparently on the very same day that Ian Fleming died], where one of the first films he saw was Goldfinger. He became a commercial artist after leaving school, but was introduced to acting by a co-worker who was in a theatre group in the evenings. He left his job for the life of an actor, and entered the Drama Centre in London, where he studied acting for 3 years. After several years of stage work throughout the UK, he began to work in television and film. His "big break" came with the 1981 ABC-TV mini-series The Manions of America, which led to him getting the title role in the popular long-running detective series Remington Steele, which debuted in 1982. Rumors began as early as 1984 that Pierce would replace Roger Moore as the next James Bond. Due to contractual obligations, he was unable to accept the role when it was originally offered to him in 1986. On June 8, 1994, Pierce Brosnan was unveiled at a huge press conference in London as the 5th 007. 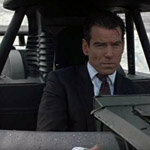 His first Bond film, Goldeneye, grossed over $350 million worldwide, more than any other Bond film to that point. His 2nd Bond film, 1997's Tomorrow Never Dies, grossed more money in the US than GoldenEye. Together, his 4 Bond films have grossed over $1.6 billion worldwide.